While Wynter Kabimba, representing the Zambian regime was in Khartoum, Sudan receiving money for his political activities from the rulers of that country, our brothers and sisters in Darfur were ‘receiving’ bullets and bombs from the Sudanese government forces. Kabimba is the president of the so-called Council of African Political Parties, which is financed by Sudanese President Omar al Bashir. Bashir is an international criminal wanted by the International Criminal Court for the genocide of more than 400 000 people. The government also cracked down on students in Khartoum peacefully protesting the violence in Darfur, resulting in the death of one and the detention of many protesters and activists. The fighting and attacks on civilians have resulted in civilian deaths and injuries, large scale destruction of civilian property, looting of livestock, and the mass displacement of more than 200,000 people in 2014 alone, according to the United Nations. In late February and early March, a mixed government force of Sudanese military and militia known as the Rapid Support Forces, which had previously been deployed against Sudan Revolutionary Force rebels in North Kordofan, attacked dozens of ethnic Fur and Zaghawa villages in South Darfur. Community leaders from Hijier and Um Gunia villages gave Human Rights Watch a list of 38 civilians who were killed, and 10 others who are missing. They said many of the dead bodies were left unburied as people fled. For those who have not been following events in that region, Darfur is a region in Sudan the size of France. It is home to about 6 million people from nearly 100 tribes. Some nomads. Some farmers. All Muslims. In 1989, General Omar Bashir took control of Sudan by military coup, which then allowed The National Islamic Front government to inflame regional tensions. In a struggle for political control of the area, weapons poured into Darfur. Conflicts increased between African farmers and many nomadic Arab tribes. In 2003, two Darfuri rebel movements- the Sudan Liberation Army (SLA) and the Justice and Equality Movement (JEM)- took up arms against the Sudanese government, complaining about the marginalization of the area and the failure to protect sedentary people from attacks by nomads. The government of Sudan responded by unleashing Arab militias known as Janjaweed, or “devils on horseback”. Sudanese forces and Janjaweed militia attacked hundreds of villages throughout Darfur. Over 400 villages were completely destroyed and millions of civilians were forced to flee their homes. In the ongoing genocide, African farmers and others in Darfur are being systematically displaced and murdered at the hands of the Janjaweed. 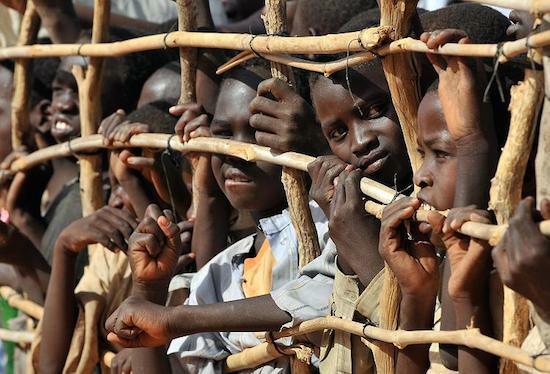 The genocide in Darfur has claimed 400,000 lives and displaced over 2,500,000 people. More than one hundred people continue to die each day; five thousand die every month. The Sudanese government disputes these estimates and denies any connection with the Janjaweed. The Sudanese government appears unwilling to address the human rights crisis in the region and has not taken the necessary steps to restrict the activities of the Janjaweed. In June 2005, the International Criminal Court (ICC) took the first step in ending impunity in Darfur by launching investigations into human rights violations in Darfur. However, the government of Sudan refused to cooperate with the investigations. Darfuris today continue to suffer and the innumerable problems facing Sudan cannot be resolved until peace is secured in Darfur. According to UN estimates, 2.7 million Darfuris remain in internally displaced persons camps and over 4.7 million Darfuris rely on humanitarian aid. Resolving the Darfur conflict is critical not just for the people of Darfur, but also for the future of Sudan and the stability of the entire region. NOW, these are the people Kabimba is proud to associate with and get money and abuse the names of Mandela, Patrice Lumumba and Mwalimu Nyerere and other founding fathers of Africa to put on the entrance of their offices? It’s a pity that Kabimba is using the name of our country to get bloody money from those international criminals. Kabimba should check his desperation otherwise it will soon consume him. Infact, all the bigger countries in Africa have snubbed that council of his which is meant to give Omar al Bashir a platform. Is Kabimba happy with what Omar al Bashir did to South Sudan?